Binary.com is an established trading brand. The company started in 1999 under the name of BetOnMarkets.com, and re-branded to Binary.com in 2013. It has evolved over the years to become one of the most respected trading brands in Europe and Asia. Bonus – There is an exclusive bonus option, which can be obtained by opening a demo account and then upgrading to a real-money trading account. The Binary.com trading platform is a fuss-free system, with all the essentials that any trader could ask for. The platform is simple – mainly just showing key trading information without any gimmicks or flashy icons. This system is preferred by a lot of traders, with information available at a glance, without too many features or extras crowding the viewing platform. · MetaTrader 5 -An advanced CFD trading tool. This allows the Binary.com platform to have MetaTrader integration for MT4 and MT5. · Binary WebTrader – This gives traders the option to watch and track multiple underlying assets, and to trade across them at the same time. Binary.com offers a free mobile-trading app, and this is currently only compatible with Android 2.3 or above. The app features all the same options as the main website, including all the asset options. The app uses the same clean, clutter-free design as the website. This makes it excellent for use on the smaller screen of a smartphone or tablet. Binary.com boasts one of the biggest and most varied ranges of deposit and withdrawal options in the industry. The minimum deposit is dependent on the method used, starting at just £5 for some. The withdrawal options are the same as for deposits. Some methods are subject to longer processing time, and this should be taken into consideration when choosing a withdrawal option. The customer support team is available via email, with a separate dedicated email address for payment enquiries. There is a UK landline telephone service which can be contacted for support or account queries. Due to its long-standing reputation and well-established systems, Binary.com is one of the most popular trading platforms in the industry. 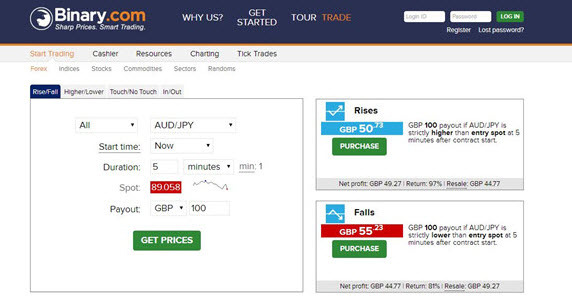 The Binary Bot feature allows traders to create and operate an auto-trading robot. This makes the company a big draw for experienced traders. The easy, clean trading platform makes Binary.com excellent for new traders. The company produces many educational guides to trading, and often releases free education materials.